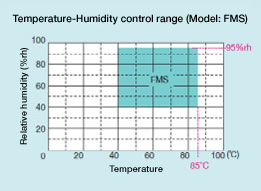 Low Temperature (& Humidity) FM Chamber - DAINAN TECH (S) PTE. LTD. 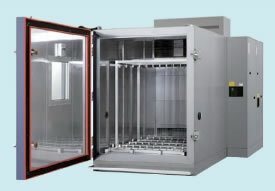 The test area dimensions of the FM Chamber can accommodate changes in units of 50 mm according to the module size and number inserted. The chamber support various IEC standard tests. It can also be used as a temperature and humidity chamber for PID evaluation by adding insulation measures and high-voltage static charge prevention measures. *1 At any point except 1/6 area of the inside dimensions from the wall surface 120 minutes after the chamber temperature and humidity have become stable without a specimen or load. Use the following options if there is a possibility that acetic acid or phthalic acid may be generated from the specimen during operation at high temperature and humidity.